Soap operas don't only happen on our televisions. The story on the Trumpeter Swan family above is an interesting one and has all the intrigue, despair, compassion and love as any soap opera created in Hollywood. Since this story is true and stars a former REGI patient, we are even more excited. The photo was taken by friend and swan aficionado Barry Wallace, Hudson, WI. I have discussed Barry and his amazing contribution to the Trumpeter Swan population of both WI and MN in an earlier blog posting. If you have not read it, just believe me, he is one terrific person. 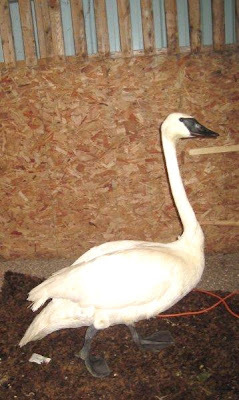 The swan wearing the yellow neck collar 86C was a patient at REGI three years ago. 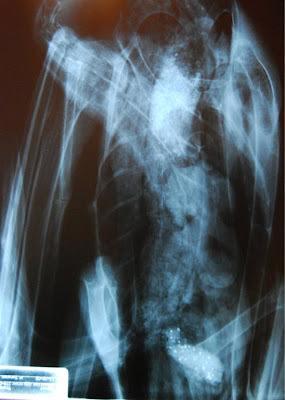 She and her mate both had lead poisoning. Her mate died before he could be captured, but 86C survived and was brought to REGI for rehabiliation and released two years ago. State of Wisconsin Avian Ecologist Pat Manthey e-mailed the following history of the swans in the photo.
" Here's the story. 41N is the son or daughter of 56A. The mother was 24C. She was found dead of lead poisoning mid-summer. In the fall of 2009, 56A found a new mate. The new mate was former REGI patient, 86C, who lost her own mate to lead poisoning, when she herself was poisoned over three years ago. They found each other when 86C had flew into his (56A) nesting pond with several other swans. The site is privately owned beaver pond near Hayward; we call it Chippanazie Lake Beaver Pond. We know all this because the landowner is a close observer of "his" swans. He retrieved the dead 24C so we could get a necropsy, and he observed the new pairing-up of 56A." I hope you have been able to follow all the references to "numbers". 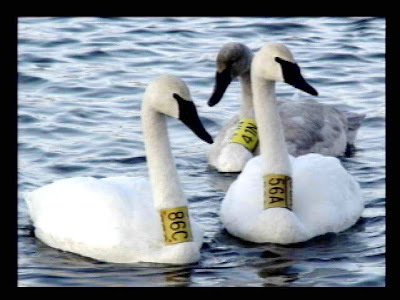 The State of Wisconsin, as well as several other states, uses an alpha numeric system on neck collars of Trumpeter Swans as a way to identify the birds in field situations. That way, it is easy to document the swans' movements, migration and breeding success or failure. Trumpeter Swans were on the Endangered Species list until last fall in our state but are still endangered in several other states. This week we will be doing several pre-release physicals or "exit" physicals, as I like to call them. This will be the last time we examine the birds before they are free birds once more. Most of those physicals will occur on Saturday because we are releasing the Bald Eagles on Sunday the 31st. However, one will be done on a Trumpeter Swan that has been here since spring. She came in with lead poisoning. It has taken these months until she is ready to take her place in the wild once more. I am finishing the "end of year state and federal reports" today. If you call and find me grumpy...well, I will be. zen thought; think of the beautiful trees that made paper work possible.